by wangdu on September 4, 2013 in News, Shrine Room Project. Bodhicharya Berlin has adopted a 3.49 m high Buddha statue, the meanwhile quite famous “Viktualienmarket-Buddha”. This art installation by the Malayan artist Han Chong “Made in Dresden” is part of a series of art projects in Munic. The London based artist, himself a Buddhist, has created a Buddha statue in the lotus position, deliberately laid on the back. He wants to raise questions about using religious symbols as souvenirs or decoration, far away from their spiritual context. Bodhicharya Berlin has applied for the Buddha, after the end of the exhibition. The artist is very happy that his artwork will find a place in the Bodhicharya Berlin temple, that way being transformed back into a religious symbol useful for the Buddhist community. He and the organisers agreed to give the Buddha as a donation and even repair the back. 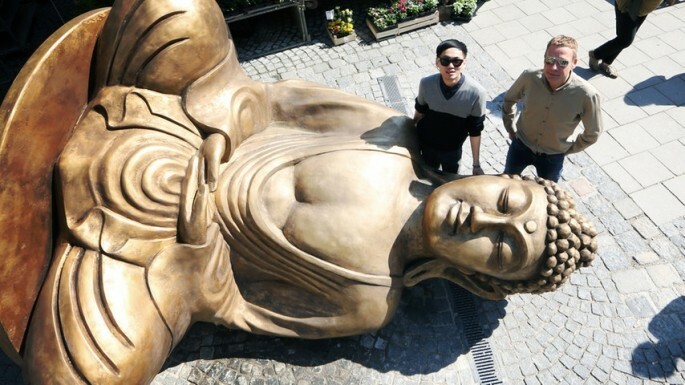 Some Buddhists protested against the artwork and demanded it to be removed. Other Buddhists supported the worthwhile aim and the context of the exhibition. Bodhicharya Berlin is happy to give the Buddha, then in an upright position, a permanent home, that way contributing to a peaceful and harmonious end of the art installation. The form of the Buddha is modelled after the bronze statue Kamakura Daibutsu in Japan, which is 12 m high and was erected in the 13th century. Every year more than one million people from all over the world make a pilgrimage to Kamakura to see this bronze statue. Here are some more pictures of the statue.